In Sweden, MAX’s burgers is the food chain that outperforms all other fast food restaurants by far, according to customer surveys. Max doesn’t just make a really, good beef burger, they also offer delicious veggie alternatives like a halloumi burger and a vegan BBQ sandwich. Yes, you heard that right. 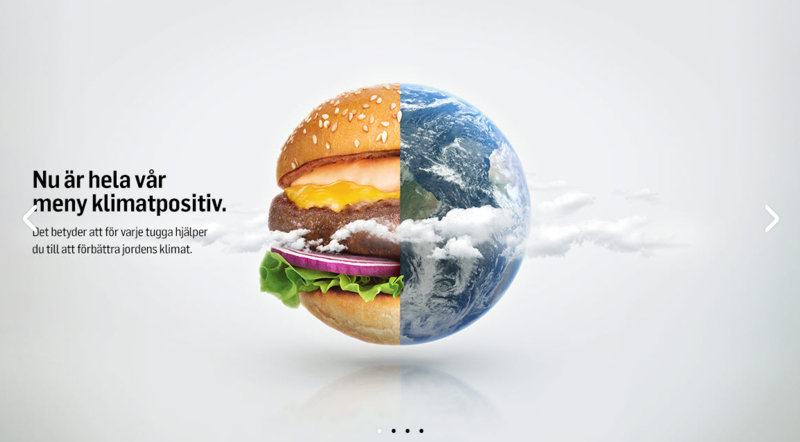 Max Hamburgers, which was founded in 1968 by Curt Bergfors in Gällivare, has for a long time worked consciously with its impact on the environment. Max has since 2008 produced the most extensive environmental analysis of all fast food chains in the world. On June 14, 2018, the food chain introduced its most environmentally friendly menu yet. The entire menu is what Max calls Climate Positive, meaning that they do not only compensate for 100% of the company’s carbon footprint but exceeds it by 10%! By planting trees which absorb carbon dioxide, Max Hamburgers actively reduces existing amounts of carbon in the atmosphere. “To reach the “two degrees goal” of the Paris Agreement, it’s not enough to just compensate for current emissions,” says Kaj Török, CRO & CSO at Max Burgers, at the Sustainable Brands fair in Vancouver on the 5 of June. You can see his whole presentation on Max’s work as a sustainable brand here. According to Kaj Török, the devil is in the details. Max’s environmental analysis, available to the public and tallied by Ernest & Young, includes emissions produced from the start of production to point of consumption. Read the entire report (in Swedish) here. Rebecca is originally from Gothenburg and holds a B.Sc in Economics and Political Science. During her time at university, Rebecca has worked part-time in service and most recently as CSO at Nordea, the largest financial services group in the Nordics. Rebecca was also the Board Secretary for the Society of International Affairs and a part of the board of the Swedish Red Cross Youth Organisation. She has previously written for a foreign policy magazine, Utblick. Currently, she is finance and accounting manager for the Swedish-American Chamber of Commerce and Editor for Swedes in the States. Next articleHow About A $300 Princess Cake Bag?